Civil Litigation – General Liability, Transportation, Medical Malpractice, and Nursing Home Defense,. I was encouraged to join the WBAI by current President Karie Valentino, whom I am very fortunate to have as a colleague and mentor. I am very glad that I did. 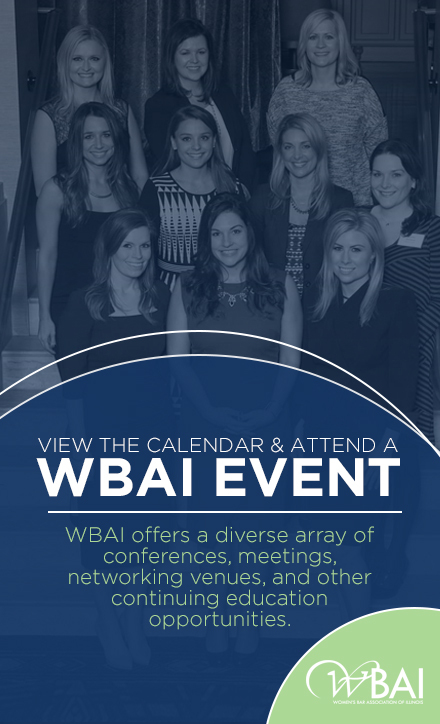 All of the programming and events that WBAI has to offer are great opportunities to meet and network with like-minded attorneys and help support one another in this profession. I also appreciate the fact that there are numerous ways to give back and contribute to the organization and Chicago’s legal community through WBAI’s various committees. I believe that the best way to empower women in law is to be an empowered woman lawyer yourself, and to provide opportunities for advancement to other female attorneys. Women in the law still face unique professional challenges, and by sharing our knowledge and experience about those obstacles and how we have overcome them, we become better lawyers ourselves and help other women flourish. I have been fortunate to have several female attorneys who have taken the time to provide invaluable guidance and advice and help me achieve continued growth and success as a litigation attorney. I hope to pay it forward in my continued involvement with the WBAI. Personally, I could not be more excited to welcome my first child and begin the adventure of motherhood. Professionally, I am looking forward to achieving continued successful outcomes for our clients, including at several upcoming trials. I am also looking forward to developing a personal and professional balance that allows me to focus on both my growing family and continued growth professionally. Travel and experiencing different cultures has been a life-long passion of mine. I was fortunate to travel to South Africa for a comparative constitutional law and human rights course in law school, and had the honor and pleasure of meeting and speaking with Nelson Mandela’s lawyer, George Bizos. He said to me, “Never sell yourself short – there is always more room at the top.” I keep that advice in mind and it continues to inspire me to keep striving for my best.